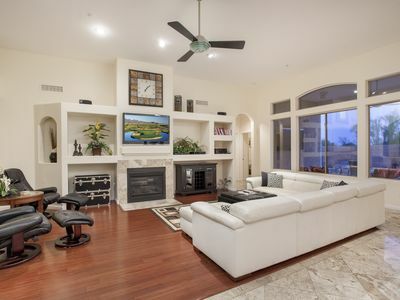 Scottsdale Condo w/ Pool - 6 Miles to TPC Golf! 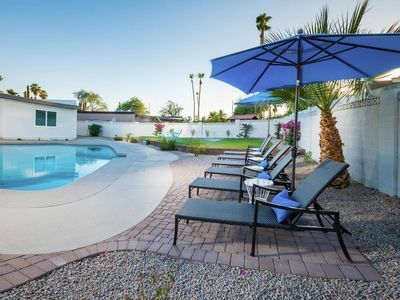 Soak up that Arizona sunshine while you stay at this 2-bedroom, 2-bathroom vacation rental condo that sleeps 6 in Scottsdale. 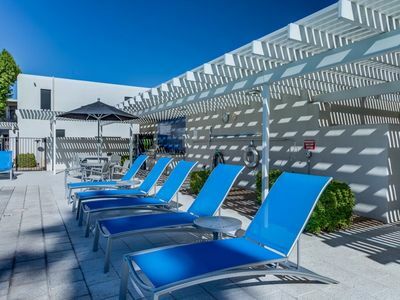 You'll feel like a VIP member inside Aventura Condos, where pools, hot tubs, tennis courts, and grills are readily available for you - found just outside your front door! 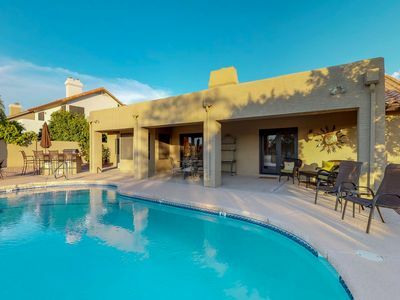 Spend your leisurely summer days golfing the fairways, shopping through Scottsdale, and sunbathing poolside, all while taking on the laid-back lifestyle of those easy-going Arizona locals. Start each morning with mimosas on the private balcony, where time passes slowly and the sun shines bright. 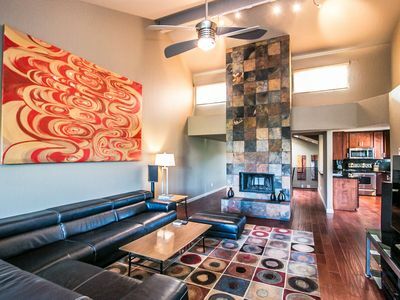 When you're ready to take on the day, the community clubhouse awaits you downstairs with on-site amenities including the 3 pools, plenty of lounge chairs, patio tables, gas grills, a well-equipped fitness center, lavish outdoor fire pit, and more! When the day comes to a close, and the weather starts to cool, retreat inside for an evening of relaxation. 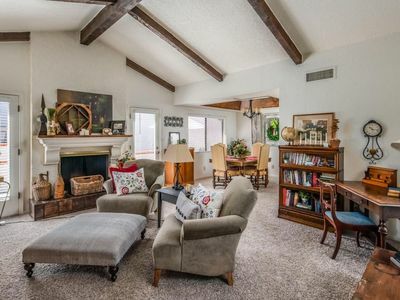 Warm up with some logs on the wood-burning fireplace while friends get comfortable on living room couches and choose a feel-good movie to watch on the flat-screen Smart TV. Refuel friends with a home-cooked meal each evening! The kitchen is fully equipped with brand new, stainless steel appliances and ample granite counters to assist in any and all culinary creations. When you're ready to serve, bring your feast to the 4-person dining table for a good meal with great company. End the day just as you started it - outside in the fresh air on the balcony. Your sunny oasis now serves as the perfect spot for late-night storytelling and wine sipping with friends. When you're ready to retire for the night, you'll find 2 bedrooms inside, each equipped with plush king beds, flat-screen Smart TVs, and personal bathrooms to ensure a luxurious stay. 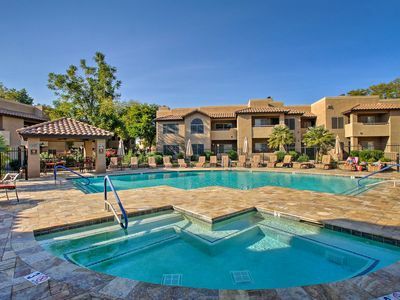 You're ideally located for non-stop fun in the heart of Scottsdale! Take a walk outside the complex to find shops, restaurants, and local hot spots lining the streets. If you prefer mountains over malls, drive 25 minutes to Pinnacle Peak Park for an adventure through the desert landscape! 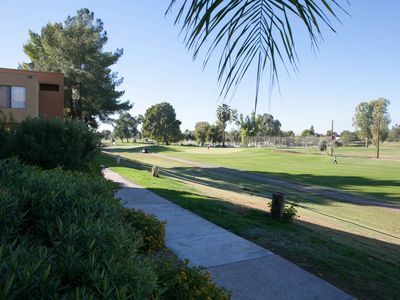 Take part in Arizona's favorite pastime and tee off at one of the local golf courses. 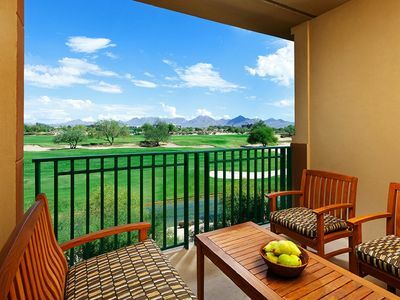 The world-famous TPC Scottsdale course is just 6 miles away, with Gainey Ranch, Camelback, Talking Stick, Orange Tree, and Starfire Golf Course all within a 10-mile radius as well. When March rolls around, Scottsdale draws crowds from all around for the Spring Training games! 15 MLB teams play in the area, so be sure to snag your ticket to a game at the Salt River Fields, Scottsdale Stadium, Maryvale Park and more! 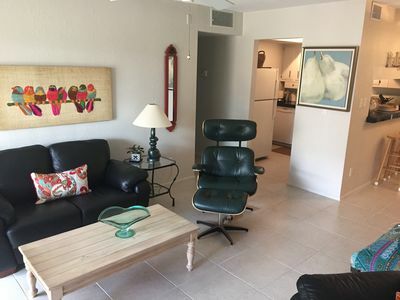 - Amenities include a fully equipped kitchen, private balcony, free WiFi, 3 flat-screen cable Smart TVs, central air conditioning, in-unit laundry machines, covered parking for 1 vehicle, and much more! 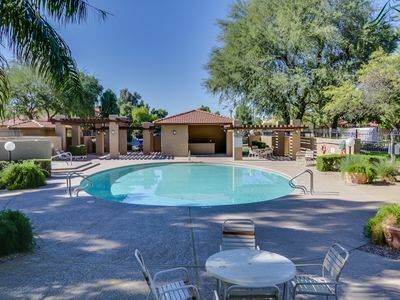 - Access to community amenities including 3 pools, hot tub, tennis courts, gas grills, fitness center, clubhouse, and outdoor fire pit! 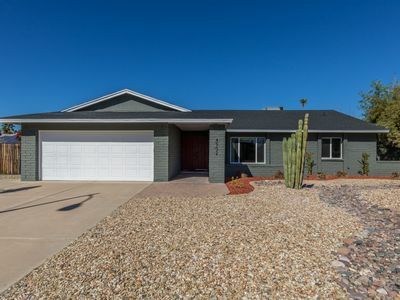 - Superb Scottsdale location - Ideally located for nearby access to shops, restaurants, hiking trails, golf courses, and Spring Training facilities! 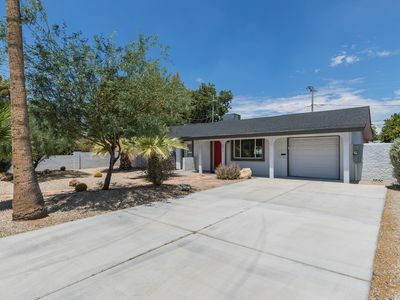 Lovely, quiet, safe neighborhood close to everything in Scottsdale! 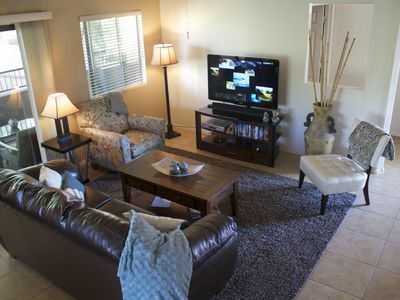 Beautiful two bedroom for 4 people to relax. NEW! 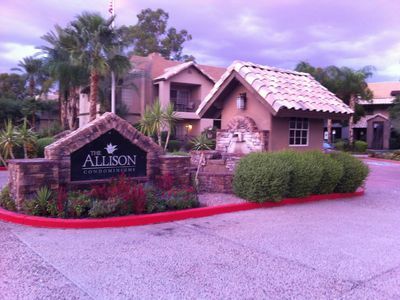 Newly Remodeled 2BR Scottsdale Condo! 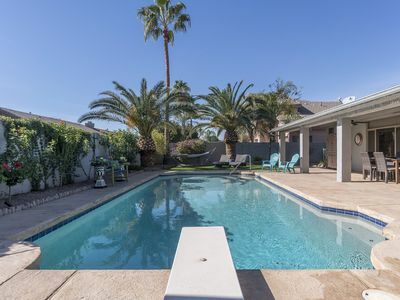 LOCATION Home in the Heart of Paradise Valley. Walking Distance to Everything! 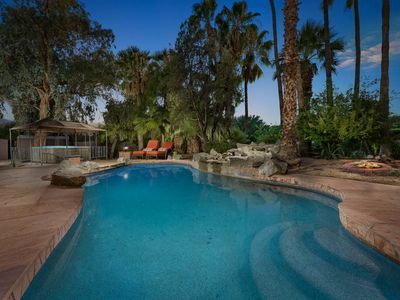 Private HEATED Pool + Hot tub. 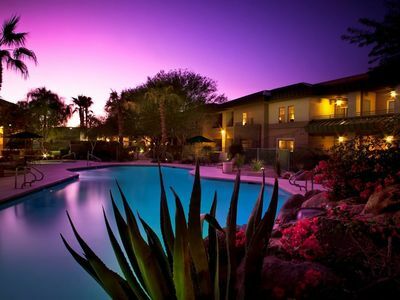 Experience everything Scottsdale has to offer! Horseback or hike the red rocks! NEW LISTING! 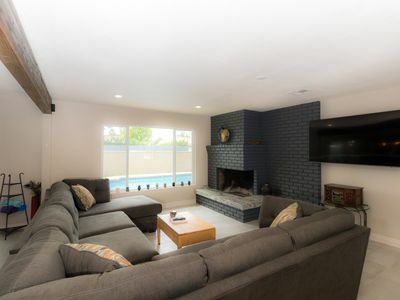 Lavish home w/ private pool, hot tub, & putting green - dogs OK! 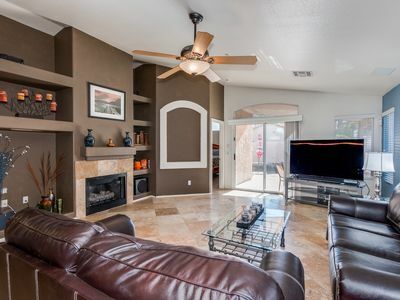 Gorgeous home with resort style back yard in Old Town Scottsdale!! !